Equestrian Trend: Equiline Fall/Winter 14/15 - Get In The Mood! Today it was a rainy day and, for the first time this year, I truly felt Fall is coming! 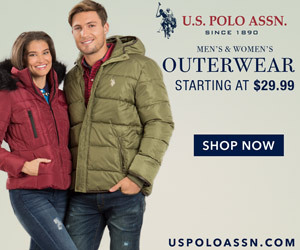 I don't particularly love this season, specially when I go to the barn and it is raining but some cute riding clothes for me and some fabulous blankets, coolers or even sheets for my girl would make this Fall/Winter a lot better! I hope Santa brings me some Equiline swag! I have already published this entire collection here on Equestrian Trend a few months ago (see it here, here, here and here) but since the collection only arrives in stores this week, I will show you the five moods of this collection, as well as some suggestions, so that you can choose your own Equiline mood! Prince of Wales plaid delicately sculpted onto technical fabrics and nylon solids with hints of plaid trim give way to an elegantly preppy and classical look. Breeches with all over plaid , 'Evie', or perhaps just a patch on pockets and trim are very much in style this season. Sara quilted bomber in Atlantic deep and Evie full-seat breeches in Prince of Wales plaid in Baltic blue. The embroideries provide extra refinement and timeless elegance to beautiful silhouettes but embroidery can be sporty too when paired with the youthfulness of a luxurious cotton hoodie as seen on the ‘Mia’ in blue night with contrasting ivory stitching. Annabel softshell jacket in cyclamen with Ash X-Grip breeches in Navy. Bold effects and oversized ton-sur-ton (tone-on-tone) logos create excitement and enthusiasm. Use of color blocking is still trending with this mood as well. The ‘Logan’ men’s quilted vest is an example of thinking big, water resistant, windproof and highly breathable for comfort. Logan men’s vest in blue night, Amos sweatshirt in blue/apple green, and Theo breeches in grey. The High Performance mood features technical fabrics, anatomical cuts, and high stretch inserted panels that allow extreme flexibility, reducing restriction while still offering a close conforming fit. Elastic panels that run the full length of the breeches provide an added benefit of compression to help minimize muscle fatigue. The ‘Leah’ breeches come in five color ways for Fall, all with Equiline patented X-Grip for stability. Loretta polar microfleece jacket in black and Leah high performance breeches in white. This autumn general fashion celebrates color and allows the shades more typical of summer to carry through so you can layer upon your most fond summer pieces to create the warmth you need into fall with matching tones. Most popular are jewel tones; plus sunny yellow, red and various shades of green. Neon is still a focus but subdued as accents is what’s trending. Equiline predicts that the 'Tilly' ultralight weight vest is going to be a best seller. 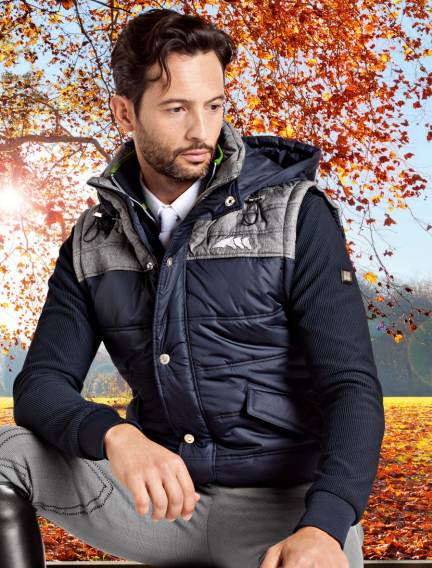 For the colder days of Winter this vest also comes in a full sleeve, hooded jacket! 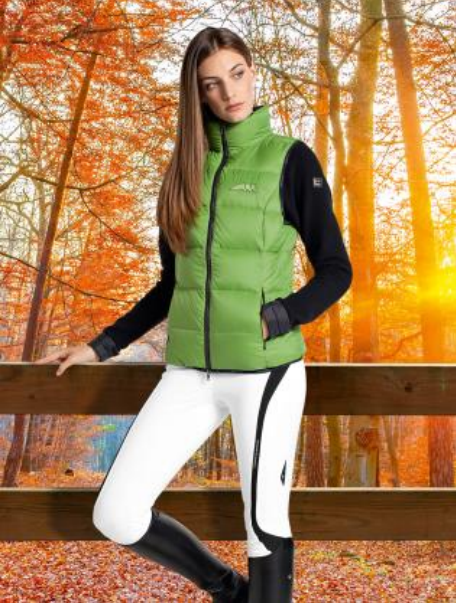 Tilly vest in apple green; Loretta polar microfleece jacket in black; and Leah high performance breeches in white. Milly down jacket in sky blue and Penelope breeches in white. As you can see, there is something for each and everyone’s particular taste among the various moods! This is one of the best Equiline collections ever, the technologies and the improvements are incredible, the colors are unique and the embroideries are powerful! 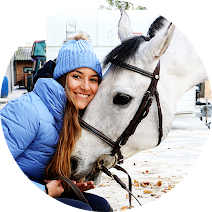 I adore this collection and according to Equestrian Trend statistics, many of you were really excited to see it - I am so glad I can show you the collection! Love the colours, winter can be dark we need bright colours to cheer us up. We sure do! You're welcome A.!